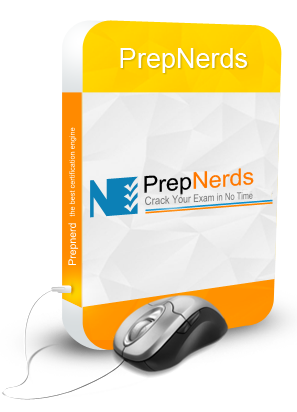 PrepNerds – Crack Your Next Certification Exam in No Time! PrepNerds is an I.T certifications preparation material providing company that helps to get certified from almost all famous & major brands like Cisco, Oracle, IBM,HP,CompTIA and Apple etc. Join us if you want to enhance your knowledge in such professional way. With our products, we will drive your brains on the routes of success. In this fast changing world, major global companies are in need of I.T professionals who can do their job expertly. We provide “Practice Test” that simulates real exam scenarios. The success rate of our product is 100% because that preparation material is efficiently and competently created, designed and prepared by expert I.T professionals. Our preparation material includes exam specific resources that equip you with distinct competence. We offer an updated and verified questionnaire, which reflects the actual certification exam. Our product will teach you new tact’s to get prepared for exam in shortest possible time. It would also eliminate anxiety and nervousness of new examinee. PrepNerds provides you to pave your way with success. So that’s you can shape your dream in reality. Grab the unique benefit of Prepnerds training material and step up your career towards esteemed recognition. To check our product quality, you can download Free Demo which we offer for every person who visits and make an account on our website. Through getting this, you will become familiar with format, content and subjects about which certification you have decided to achieve. It will help you to make your decision so easy to purchase. Our mission is to provide you valuable solution to pass your IT certification. To achieve this mission, we have an excellent and competent customer support crew to help you about to use our products expertly. You can call to our customer support staff for any immediate help. They are available 24/7 to answer your queries. Once we have committed to serve you with excellent and accurate preparation material for certification exams, it’s our responsibility to provide. If you would not crack your certification exam by using our preparation material, we will return your complete payment 100%. Our money back guarantee boosts your confidence while you are preparing and attend your certification exam. At the time of result, if you want to see your name in passing list, you should buy our material atleast 7 days before the actual exam. It’s our guarantee you will pass for sure in your IT certification in first attempt.